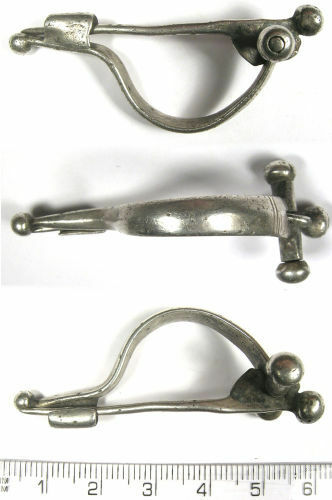 Cast silver light crossbow brooch dating from the late 2nd/early 3rd century. Hinged mechnism, still in working order; axis bar moves freely. A complete silver light crossbow brooch dating from the Roman period, that is c. AD175-250. The brooch is complete and in good condition. The hinge mechanism is intact and still in working order. The bow is lightly-keeled and ends in a pronounced, circular foot knop. Both wings as well as the terminal of the pin end in a similarly sized and shaped foot knop. The bow does not show any decoration except a bundle of grooves towards the head end. The brooch is silver and dates from c. AD175-250. Consequently, in terms of age and as the object contains a minimum of 10% precious metal it qualifies as Treasure under the stipulations of the Treasure Act 1996. However, with no information available to us concerning the find circumstances the object must be evaluated under Treasure Trove law. To this end, we feel it is highly unlikely that this find, as a single object with no evidence of having been deliberately hidden with the intention of recovery, would have qualified as Treasure Trove.